In the spring of 2015, the Library commemorates the sesquicentennial of the final months of the Civil War in Missouri and Kansas with a post derived from the thousands of primary sources that are digitized and incorporated into its Civil War on the Western Border website. The Library and its project partners assembled this rich repository from the collections of 25 area archives, combining it with interpretive tools and original scholarship produced by nationally recognized historians. Nearly four years after the beginning of the Civil War and two years after President Abraham Lincoln's Emancipation Proclamation took effect in states that had joined the Confederacy, the institution of slavery still lingered in the border state of Missouri. But for the state's enslaved population, the long wait for legal emancipation was finally coming to an end. 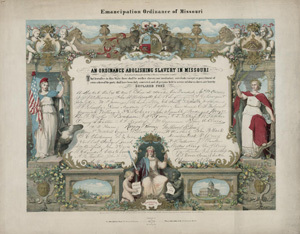 On January 11, an ordinance of emancipation officially freed the state's slaves. As Missouri was considering emancipating its slaves, Kansas was in the midst of pushing its governor-who was previously admired as "The War Governor"-out of state office. 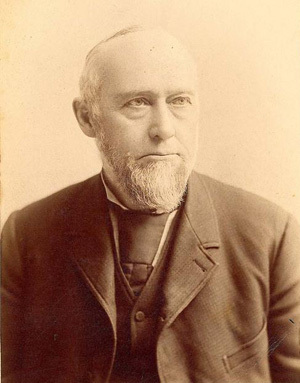 On January 9, 1865, Governor Thomas Carney 's term as governor ended in the midst of a heated rivalry between him and Senator James H. Lane, who had long alienated other Kansas leaders in his own party due to the considerable sway he held in Washington, D.C.
At a Union prison in Hilton Head, South Carolina, a Confederate prisoner from Missouri named Alex M. Bedford sought his release. 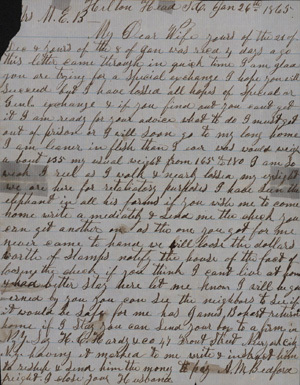 On January 26, Bedford wrote to his wife, Mary E. Bedford, to advise her of his poor health, saying "I must get out of prison or I will soon go to my long home[.] I am leaner in flesh than I ever was . . . I am so weak I reel as I walk & nearly lossed my eyesight[.]"